An international team of astronomers has observed a deep, day-long asymmetric occultation in a recently detected low-mass star known as EPIC 204376071. In a research paper published February 21 on arXiv.org, the scientists detail their finding and ponder various theories that could explain such peculiar occultation. 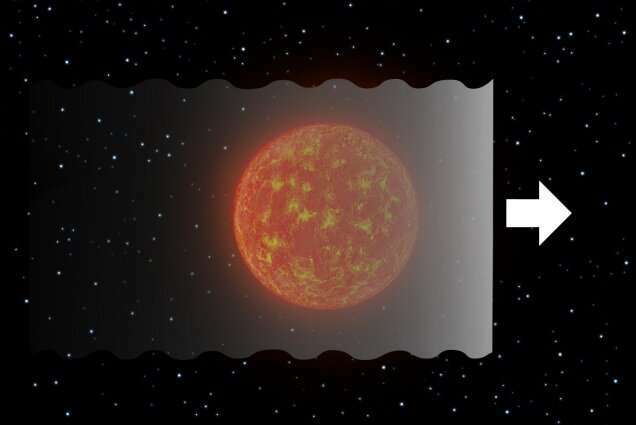 Located some 440 light years away, most likely in the Upper Scorpius stellar association, EPIC 204376071 is a young (about 10 million years old) M-star with a mass of about 0.16 solar masses and a radius of approximately 0.63 solar radii. The star has an effective temperature of nearly 3,000 K, luminosity of around 0.03 solar luminosities and a rotation period of 1.63 days. EPIC 204376071 was observed by NASA's Kepler spacecraft twice during its prolonged mission known as K2. When the star was observed by Kepler for the second time, in late 2017, a group of astronomers led by Saul Rappaport of Massachusetts Institute of Technology (MIT) identified a single occultation-like event in the light curve of the object. The detected occultation lasted for about a day and what interested researchers the most was the fact that the event was extremely deep and quite noticeably asymmetric with an egress about twice as long as the ingress. "In this work, we report the discovery of a one-day-long, 80 percent deep, occultation of a young star in the Upper Scorpius stellar association: EPIC 204376071," the astronomers wrote in the paper. The event blocked up to about 80 percent of the light for an entire day. Besides this one-day occultation and frequent flares, as well as low-amplitude rotational modulation, EPIC 204376071 turned out to be quiet for a total of 160 days of K2's two observational campaigns. According to the paper, there are a few things that make the detected event unique. These are the continuous coverage with half-hour sampling of the flux, the very clearly mapped-out asymmetry in the occultation profile, and weak emission identified in the Wide-field Infrared Survey Explorer (WISE) 3 and 4 bands. The researchers concluded that such a deep eclipse with these properties cannot be explained by another star crossing EPIC 204376071. They assume that this unique, very deep, long dip in the lightcurve could be caused by orbiting dust or small particles. The second theory is that a transient accretion event of dusty material near the corotation radius of the star could be responsible for the observed occultation. "We have explored two basic scenarios for producing a deep asymmetric occultation of the type observed in EPIC 204376071. In the first, we considered an intrinsically circular disk of dusty material anchored to a minor body orbiting the host star. (...) Second, we considered a dust sheet of material of basically unknown origin, though we do assume that the source of the dust is in a quasi-permanent orbit about the host star," the paper reads. However, the astronomers added that it is too early to draw final conclusions on which of the two hypotheses is true. More studies of EPIC 204376071 are needed, in particular, radial velocity measurements to search for evidence of an orbiting body, and adaptive optics observations to search for scattered light from disk structures or evidence of low-mass wide companions. So many different types and characteristics of stars!! Amazing that if all stars started from the same place and evolved the same way that at least we should find two that are alike. We can't. It's like what the bible says "He determines the number of the stars; he gives to all of them their names." Each one is unique. Seems more like random configurations that aren't the stars themselves but stuff around them to me. We classify stars, you know. By spectrum. Google the Hertzspring-Russell diagram. More here, specifically on a discrepancy between the most promising model so far and the rest of the data: https://www.scien...-in-town . The article suggest a protoplanetary disk, and seeing how warped they can be that could be a plausible explanation that astronomers could look into. Finally, as always, superstitious trolling (or general trolling) on science sites is not nice, stop your behavior if you can. Trolling is when people try to control the discourse for a hidden reason. I neither try to control the discourse nor do I have a hidden reason (such as backstopping the conventional wisdom, which seems to be all that you do).